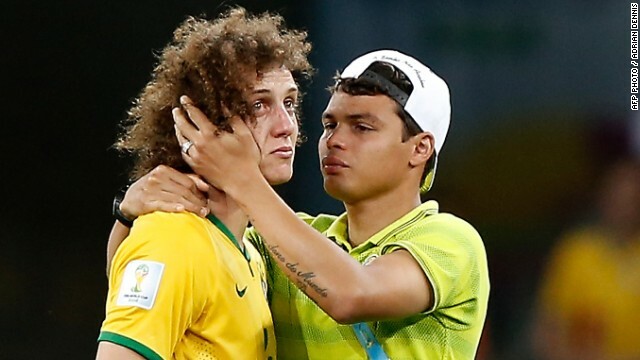 Brazil's stand-in captain David Luiz was left in tears after his side was thrashed 7-1 in the semifinal by Germany. Brazil, hoping to win the tournament for a sixth time, trailed 5-0 at halftime. 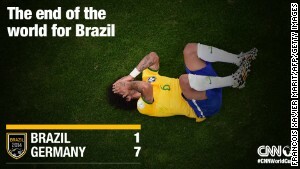 Coach Luiz Felipe Scolari said it was the worst day of his life. It was the goal which sparked the World Cup into life. 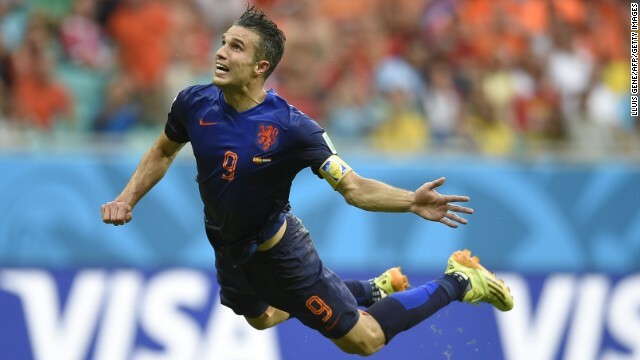 Robin van Persie's flying header helped the Netherlands to come from behind and thrash defending champion Spain 5-1. Tim Cahill's sensational volley against the Netherlands was one of the goals of the tournament. The Socceroos led 2-1 before the Dutch hit back to claim a dramatic 3-2 victory. James Rodriguez was the star of the World Cup but not even his superhero efforts could propel Colombia past Brazil and into the semifinals. Rodriguez netted a penalty -- his sixth goal of the tournament -- to reduce the deficit to 2-1 but was unable to muster an equalizer. 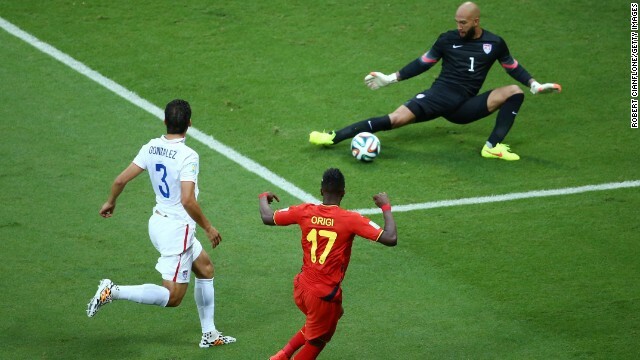 Tim Howard established himself as a U.S. hero with his performance in the 2-1 defeat by Belgium. Team USA produced a fine display to come from 2-0 down and almost take the game to penalties. Howard made a record 16 saves as the U.S bowed out at the round of 16. Julio Cesar was the hero for Brazil in its round of 16 game with Chile as he saved two penalties in the shootout, with the sides finishing level at 1-1 after 120 minutes. The U.S won its opening match against Ghana following a titanic tussle against the team which ended its dream in 2010. Clint Dempsey's early strike was canceled out by Andre Ayew's 82nd-minute equalizer. But with four minutes remaining, substitute John Brooks headed home the winning goal. 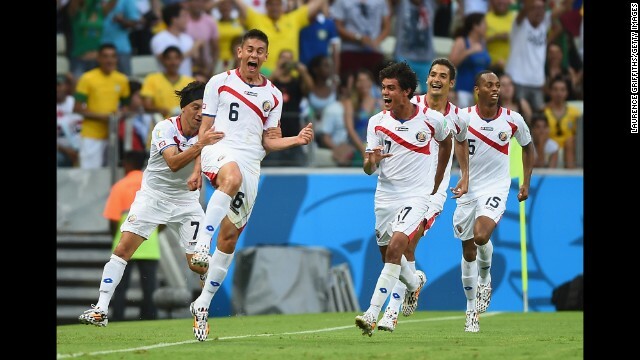 Costa Rica's 3-1 win over Uruguay was one of the tournament's biggest shocks. The minnow, given no chance of qualifying from its group, trounced a team which had finished fourth in 2010. Led by Bryan Ruiz, "Los Ticos" reached the quarterfinals before losing on penalties against the Netherlands. Lionel Messi scored twice during Argentina's 3-2 victory over Nigeria. The Barcelona forward was in unstoppable form but Nigeria refused to yield with Ahmed Musa hitting a double of his own. The five-goal thriller ended with both teams progressing into the last 16. 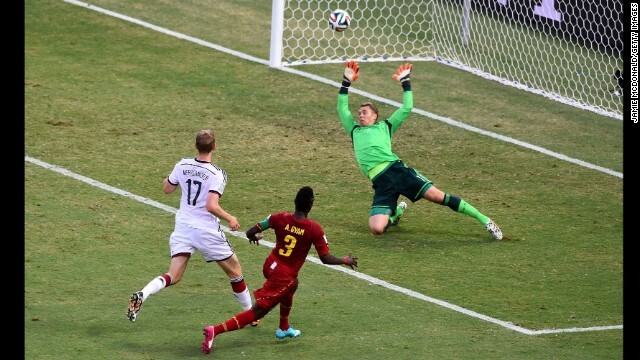 Asamoah Gyan of Ghana scores his team's second goal past Manuel Neuer, but Germany battled back to earn a 2-2 draw. (CNN) -- So that's it for another four years. After 64 games, a record-equaling 171 goals and a month of drama, tension and entertainment, the World Cup is over. It has been a thrilling ride, from Neymar inspiring Brazil to victory over Croatia in the opening game, the Netherlands smashing Spain, Costa Rica shocking the world on the way to the quarterfinals and Germany and Argentina providing the final chapter in an unforgettable episode. We've put our heads together here at CNN to come up with our top-10 matches from the tournament -- but do you agree? You can tweet us at @CNNFC with your answers and suggestions. It was the moment Brazil was supposed to book its place in the World Cup final and exorcize the ghosts of 1950. A chance for the host nation to show it was ready to erase the pain and heartache of the "Maracanazo" -- the day where it was beaten by Uruguay 64 years ago. Not for 39 years had Brazil suffered defeat in a competitive home fixture -- but that record was well and truly shattered. Without its influential captain Thiago Silva and injured talisman Neymar, Brazil was blown away in an incredible first half at Belo Horizonte's Mineraio Stadium. Thomas Muller took advantage of some dire Brazilian defending to fire home the first after 11 minutes as Germany started at breakneck speed. Miroslav Klose then added a second, making him the World Cup's leading scorer of all time with 16 as Brazil was left shell shocked. That goal sparked six minutes of madness as Germany scored four times without reply. Toni Kroos drove home a third from the edge of the penalty area before adding a fourth 120 seconds later. Before Brazil even had time to draw its breath, Sami Khedira made it five -- leaving the German players unsure whether to celebrate or laugh out of embarrassment. Brazil coach Luiz Felipe Scolari might have hoped his side would at least show some pride in the second half -- but any hope of a fightback proved futile. The Germans agreed to ease back following a halftime team-talk, but could have wracked up eight or nine such was their dominance. In the end Joachim Low's team had to end with seven following two goals from substitute Andre Schurrle. Oscar grabbed a late consolation for Brazil but even the most optimistic supporter would not have been able to enjoy such a moment. "My message for the Brazilian people is this: Please excuse us for this performance," Scolari told reporters after the game. "I'm sorry that we weren't able to get to the final." It was the game everybody was looking forward to -- and ended up being a game nobody will ever forget, especially if you happen to be Spanish. The defending champion arrived in Brazil with doubts over its ability to repeat its success of four years ago -- but nobody expected Spain to implode like it did. It had all started so well. Xabi Alonso fired home a penalty to give Spain the lead and David Silva came close to adding a second only for Jasper Cillessen to make a fine save in the Dutch goal. But just before the break it all began to go wrong. Netherlands forward Robin van Persie scores against Spain. There appeared little danger when Daley Blind took up possession on the left but his fine cross picked out Robin van Persie, who leaped like a flying salmon to head the ball over the stranded Iker Casillas and into the empty net. It was a magnificent header, a goal worthy of winning any game, let alone an equalizer. What followed was astonishing, as the Dutch blew their opponents away in one of the most one-sided halves of football the World Cup has ever seen. Arjen Robben, who missed a golden chance to put the Netherlands ahead in the 2010 final, fired home a second before Stefan de Vrij made it 3-1. Casillas then failed to control a backpass and van Persie took advantage to fire home his second. There was still time for Robben to add a fifth as Spain's defense was left decimated -- and the dominant force in world football of recent times was on the road to an embarrassing group-stage exit from the tournament. It was one of the most memorable moments of the tournament -- and it came from a man who will surely go down as one of Australia's greatest footballers. Trailing 1-0 to the Dutch following Robben's strike, Tim Cahill equalized just minutes later with an incredible strike. Ryan McGowan produced the perfect cross and Cahill met the cross first time with an exquisite volley which flew off the underside of the crossbar and into the net. It was a goal which could be compared to Marco van Basten's magnificent strike at the 1988 European Championships which is still replayed over and over to this day. The 34-year-old Cahill has scored five goals across three World Cups -- the most by an Australian. Australia, beaten in its opening game by Chile, then took a shock lead when Mile Jedinak fired home a hotly-contested penalty kick nine minutes after the break. But the Dutch roared back with van Persie netting an equalizer before substitute Memphis Depay struck the winner. It was billed as the battle between two golden boys -- Neymar against Colombia's James Rodriguez. But it was heartbreak for both following a pulsating encounter in which the myth of Brazil's beautiful game was finally extinguished. Thiago Silva's early goal gave Brazil the lead in the quarterfinal before a rasping free kick by the captain's central defensive partner David Luiz made it 2-0 to the host nation. Neymar, who had cut a peripheral figure for most of the night, was then forced off with a back injury following a foul by Carlos Zuniga. The fractured vertebra would rule the home hero out of the rest of the tournament and deny Brazil any real chance of winning the title. With Neymar off the field, Colombia hit back through Rodriguez -- whose penalty 10 minutes from time set up a tense finale and ultimately made him the tournament's top scorer with six in five games. The 23-year-old, who had been kicked around all night by Brazilian defenders, tried to create an equalizer as his teammates piled forward. But Brazil's physical approach managed to subdue the talents of Colombia, which had impressed in its first World Cup appearance since 1998. Belgium entered the tournament as one of the "dark horses" but its performances did little to inspire any confidence it would challenge for the title. Having reached the last 16 with victories by one-goal margins over Algeria, Russia and South Korea, Belgium faced a U.S. side buoyant after progressing from a difficult group. Jurgen Klinsmann's men had been unfortunate to lose 1-0 to Germany and earlier produced two fine performances to defeat Ghana and draw with Portugal -- a result which ultimately denied Cristiano Ronaldo any further chance to stake his claim as the world's best player. And in Salvador it once again gave a performance to remember, with goalkeeper Tim Howard the hero. Howard, who plays in England's Premier League with Everton, made a record 16 saves in an enthralling contest. After a goalless 90 minutes, Belgium forged ahead through Kevin de Bruyne and then extended its advantage courtesy of substitute Romelu Lukaku's strike. Two goals down at halftime of extra time, the Americans' brave effort looked dead and buried. But from nowhere, teenage substitute Julian Green netted on his competitive debut to halve the deficit. The U.S. threw everything at the Belgian defense, with Jermaine Jones firing agonizingly wide when he looked set to score. Captain Clint Dempsey, so often the hero for Team USA, then went close with a clever free-kick routine -- but Belgium held out for a quarterfinal place. After an unconvincing run to winning Group A, Brazil came up against a Chile team which had defeated defending champion Spain in impressive fashion. On the 26 occasions Chile had ventured onto Brazilian turf to face the host nation, it had lost 20 and drawn six -- not a record to inspire confidence ahead of a round of 16 clash. But Jorge Sampaoli's side, led by the talented Arturo Vidal and Alexis Sanchez, arrived with a confidence derived from a series of impressive performances. Even after falling behind to David Luiz's early strike, Chile refused to buckle and leveled through Sanchez before the break -- his 10th goal in 14 international appearances. Brazil star Neymar breaks down in sheer relief after the win over Chile. The second half consisted of both sides taking it in turns to try to find an elusive winner -- but it was Chile which came closest right at the end of extra time. Substitute Mauricio Pinilla received the ball just outside the penalty area before swiveling sharply and smashing an audacious effort against the crossbar. 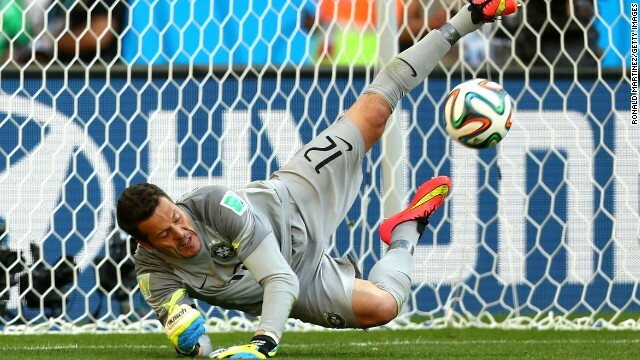 In the end, it was left to penalties to separate the sides, with goalkeeper Julio Cesar proving the hero. Cesar, cast as the villain in South Africa four years ago after his error led to Brazil losing in the quarterfinals, saved two penalties in the shootout. And when Gonzalo Jara's effort hit the inside of the post, Cesar ran away to celebrate a dramatic victory following a titanic tussle. It was one of the most dramatic goals of the tournament and it came from a man wearing the red, white and blue of the U.S.
John Brooks scored an 84th-minute winner and then broke down on the pitch in shock as his goal secured victory over Ghana. The U.S. had taken an early lead through captain Clint Dempsey but Ghana's 82nd minute equalizer looked to have denied the Americans victory. 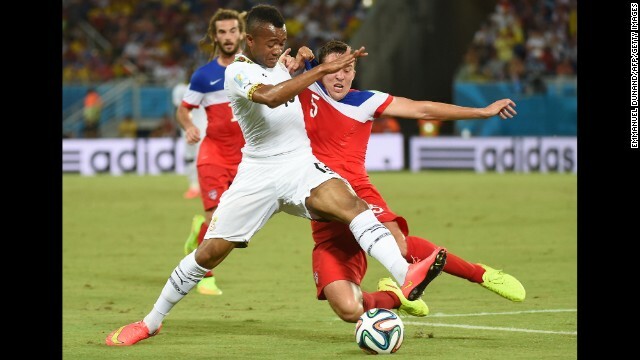 Beaten in the 2010 World Cup by Ghana, the U.S. was determined to gain revenge. And substitute Brooks proved the hero, heading home from close range to seal an opening game victory. Nobody expected Costa Rica -- a nation of just under five million people -- to do anything but make up the numbers in Brazil. Jorge Luis Pinto's side lined up in a group with three former world champions in Uruguay, Italy and England. First up it faced Uruguay -- a team which finished fourth at the 2010 tournament and won the Copa America the following year. Edinson Cavani's 24th-minute penalty gave Uruguay the advantage -- but that was only the start of the story. Costa Rica hit back nine minutes after the break when Joel Campbell equalized, before Oscar Duarte added a shock second and Marcos Urena grabbed a third to seal a momentous victory. "Los Ticos" then beat Italy and drew with England to top the group, and reached the quarterfinals for the first time after edging Greece on penalties. After toiling to a last-gasp 1-0 win over Iran, Argentina arrived in Porto Alegre to face a Nigeria team also aiming to qualify for the last 16. In a game which thrilled from the moment Lionel Messi fired Argentina into a third-minute lead, both sides went all out for victory. 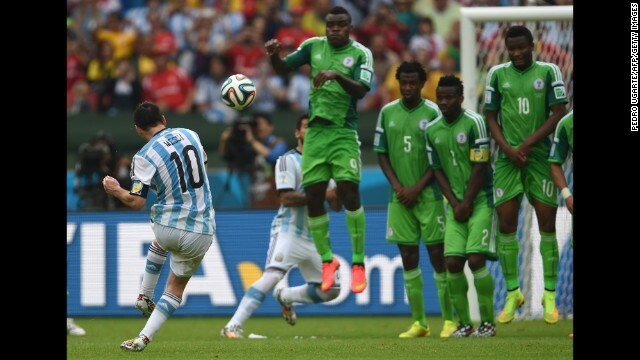 Nigeria hit back within 60 seconds through Ahmed Musa before Messi fired home a free kick on the stroke of halftime. But the African champion refused to buckle and, within two minutes of the restart, Musa curled home a stunning effort to level again and become the first player from his country to score more than once in a World Cup match. Nigeria, which had lost each of its three previous World Cup fixtures against Argentina, showed little sign of fear as it went chasing all three points. But just three minutes after it had pulled level, poor defending allowed Marcos Rojo time and space to bundle home a winner. However, Stephen Keshi's team still went through as group runner-up, reaching the last 16 for the first time since 1998. So impressed with Messi was the Nigeria coach that he commented that the forward was from a different planet -- Jupiter. Germany had never lost to an African team -- and it wasn't about to start when Ghana showed up. Having thrashed Portugal 4-0 in its opening game, the German juggernaut took a 1-0 lead through Mario Gotze early in the second half. But in the stifling heat of Fortaleza, Ghana produced a stunning comeback to lead 2-1 with two goals in nine minutes. First, Andre Ayew equalized with a bullet header before Asamoah Gyan ran clear to lash the ball past Manuel Neuer. Ghana was flying but within eight minutes it was brought down to earth with a bump as Klose poked home his 15th World Cup goal to equal former Brazil star Ronaldo's record. Both teams had chances to win the game late on but a point apiece was a fair result following a cracking contest.